Liverpool got the better of Man City on Tuesday evening, and BT Sport have documented the Reds’ Champions League quarter-final victory at the Etihad. 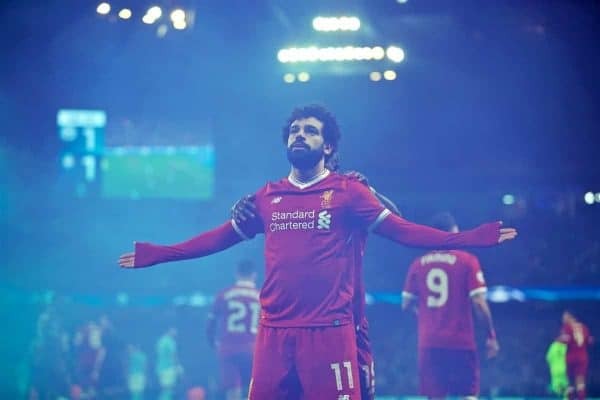 It proved to be a breathless night for the Merseysiders, who made the 40-mile trip to Manchester with a 3-0 lead from the first leg at Anfield. The tie was a long way from being over as a contest, and when Gabriel Jesus converted in the second minute, panic set in among the fans – but not the players on the pitch. Liverpool managed to ride the storm, and after an inspired Jurgen Klopp team talk at half-time, goals from Mohamed Salah and Roberto Firmino sealed a memorable 2-1 win for the visitors. The Reds have now reached the Champions League semi-finals for the first time since 2008, and there is now genuine belief that a sixth European Cup can be won in Kiev next month. The above ‘No Filter UCL’ video, provided by BT Sport, gives a fascinating insight into how the night played out at the Etihad, with lots of interesting behind-the-scenes footage. Steven Gerrard gives his thoughts on the match in the BT studio, alongside Gary Lineker, Frank Lampard and Rio Ferdinand, while Klopp conducts his pre-match interview. Pandemonium ensues among City supporters when Jesus makes it 1-0, with the home fans truly believing the comeback is on. Gerrard is still confident at the break, telling Lineker, “they (Man City) have to remain perfect if they’re going to keep Liverpool out, because they only have to make one mistake”. The legendary former captain is proved right, and when Salah dinks home his 39th goal of a staggering season, the away end absolutely erupts. The celebrations that take place between players and supporters are some of the best scenes we have witnessed after a Reds goal in many years. The Kop was opened for fans to watch the game on a big screen at Anfield, and the joy when Salah scores is equalled unbridled. Firmino’s inch-perfect finish put the icing on the cake for Klopp’s men, with more great footage of the Liverpool fans drinking in every second of the win, both after the Brazilian’s goal and the final whistle. Kenny Dalglish is seen grinning from ear to ear, seemingly giving a thumbs-up to Klopp as he leaves the field, and the manager is seen briefly chatting to Pep Guardiola in the tunnel, before a final word with Lineker. The video fittingly ends with supporters singing “Allez! Allez! Allez” outside the ground, with a long, alcohol-fueled night no doubt ahead of them. It is a must-watch for any Red – nights like these don’t come around too often.